“Panchamum Noiyum Nin Meiyadiaarkko, Paarinil Menmaigal Verini Yaarkko” (If famine and disease are for your true followers for who else then are glories in this world) – Subramania Bharatiyaar in his Ode to the Motherland’s (India) freedom. Veteran Sri Lankan Tamil political moderate leader, Murugesu Sivasithamparam, passed away peacefully after a brief illness in the Colombo National Hospital at 1:50 a.m. on June 5 2002. The ailing president of Sri Lanka’s largest democratic Tamil party at that time, the Tamil United Liberation Front (TULF), was admitted to hospital on June 1st and was pronounced out of danger two days later. Fate however decreed otherwise. The departure of Murugesu Sivasithamparam evoked nostalgic memories of a mercurial personality that strode like a colossus across the Tamil political horizon. When news of Siva’s death emerged, a sadness enveloped most people who knew of him. In contrast, the younger generation of Tamils who know very little about the pre-militancy period of the Tamil non-violent struggle for restoration of lost rights seemed the least concerned. It is relevant therefore to dwell briefly into Sivasithamparam’s past to know more about a man who devoted his life to the Tamil cause and made great personal sacrifices for it. Sivasithamparam was literally a towering personality in the political landscape of the island. A well built six footer with a stentorian voice, the mercurial Sivasithamparam was for more than four decades an accredited leader of his people. The brilliant lawyer was a powerful orator and ebullient debater who cut a flamboyant figure at the height of his career. He was at the time of his death the senior-most Tamil MP in parliament, having been nominated in 2001 on the national list by the newly formed Tamil National Alliance. He was of aristocratic lineage being the scion of a “maniagar” or hereditary chieftain in charge of a revenue division during British colonial days. Sivasithamparam studied at Karaveddy Vikneshwara College and St. Joseph’s College in Colombo. He enrolled at the University College and read for his BA. Despite the feudal upbringing, the younger Sivasithamparam was enamoured of Marxism and became a Communist Party supporter in his undergraduate days. One reason for this apart from the idealism of youth, was the influence of the legendary Pon. Kandiah or ‘Communist’ Kandiah of Karaveddy. He dropped out of university after getting his London Inter and joined the Law College becoming an advocate. He also abandoned his Communist sympathies in later years and took up the cause of Tamil nationalism. The process was gradual. In 1947 he supported Pon. Kandiah of the CP in the Point Pedro electorate of old that encompassed Karaveddy. 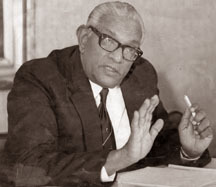 In 1952 while sympathetic to the CP still, Sivasithamparam supported his uncle and well known lawyer K. C. Nadarajah, who contested as an independent in Point Pedro. It was ‘K. C’. who helped Sivasithamparam set up practice in Colombo. Siva contested the Point Pedro electorate in the Jaffna peninsula as an independent candidate in 1956, polled 8054 votes and lost to his former mentor, Pon. Kandiah of the CP. Although an independent, he had the support of the All Ceylon Tamil Congress led by G. G. Ponnambalam for the campaign. The break with the CP was complete. The Federal Party led by S. J. V. Chelvanayagam fielded K. Thurairatnam in 56. Two years later, Sivasithamparam joined the Tamil Congress and went on to become its general secretary. The re-demarcation of 1959 saw the former Point Pedro being carved into Udupiddy and Point Pedro electorates. Siva was returned to parliament for the first time in March, 1960 getting 7365 votes and winning the Udupiddy seat on the Tamil Congress ticket. He defeated the sitting MP, Pon. Kandiah, his one time guru by a majority of 1938. The left being divided, helped Siva as the combined votes of the LSSP’s R. R. Dharmaratnam and the CP was higher than the TC’s tally. Siva repeated his performance in 1960 July, too, harvesting 9080 votes. The TC was routed by the FP in both elections. But the personal charisma and popularity of Siva helped him withstand the “Thamilarasu” tidal wave. He was then the sole representative of the Tamil Congress in a parliament of 157 MPs. The well-built Sivasithamparam with his unique voice made a tremendous impression and the lobby correspondents of the day referred to him as the most promising new face from the north in parliament. 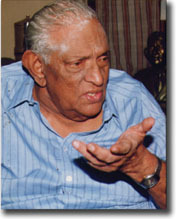 Felix R. Dias Bandaranaike was his equivalent from the south. In 1961, Sivasithamparam shed party differences and participated in the massive Satyagraha campaign launched by the FP. He was a member of the action committee in Jaffna. When the “illegal” Tamil Postal Service was organised as part of civil disobedience, separate stamps and envelopes were printed. Sivasithamparam was one of the ‘postmen’ and delivered by motor cycle an ‘official’ letter informing the Jaffna police superindent of the postal service. He was assaulted severely by the army when trying to protect women Satyagrahis. He was hospitalised for days. This incident increased Sivasithamparam’s political stature among the Tamil people. Interestingly Sivasithamparam was not placed under house arrest at Panagoda along with FP leaders and stalwarts by the government. This was a not so subtle move to divide the FP and TC who were coming close politically. Sirimavo Bandaranaike’s government resorted to such stratagems in 1976 also. The newly formed TULF leaders were distributing leaflets in Jaffna. Messrs A. Amirthalingam, M. Sivasithamparam, K. P. Ratnam, K. Thurairatnam and V. N. Navaratnam were arrested. Then Sivasithamparam of the Tamil Congress was released while the others, all of them from the FP were taken to Colombo and detained for 10 days. This was followed by the famous trial at bar case over charges of sedition against Amirthalingam. Sivasithamparam with 12009 votes won again on the Tamil Congress ticket in 1965 March, in a triangular contest with the FP ( 8452) and LSSP( 5268). Again the combined vote of his opponents was higher than Siva’s total. But then, the first past the post winner system in vogue permitted such winner take all type of victories. The Tamil Congress with three seats joined the national government of Dudley Senanayake. While Murugeysan Tiruchelvam of the FP became local government minister, the TC took no office. In 1967, the then Speaker, Sir Albert Peries of Nattandiya died and was succeeded by his deputy Shirley Corea of Chilaw. The deputy speaker’s office was filled by Sivasithamparam. He served as deputy speaker of parliament from 1967 to 1970. He was proficient in all three languages and presided over the House in a creditable mode. Once when T. B. M. Herath of Walapane was troublesome, Sivasithamparam spoke to him in chaste Sinhalese and tactfully persuaded the overwhelmed Herath to yield. On another occasion Siva admonished his own leader G. G. Ponnambalam, much to his chagrin for unfairly criticising Amirthalingam when the latter was not present in the House. In spite of the prestige he acquired as deputy speaker, Sivasithamparam lost his seat in 1970 to the Federal Party in what was widely regarded as an electoral upset as the ‘Udupiddy lion’, regarded as unbeatable was beaten in his own den. Three factors contributed. First, the FP candidate K. Jeyakkody, a former district judge had contested and lost all three previous elections and cut a pathetic figure. There was a groundswell of sympathy on account of this. Second, the large numbers of so called “low caste” Tamils who had voted along with progressive Tamils for the left parties were now disillusioned with both LSSP and CP for aligning with the racist and reactionary SLFP. These sections deserted these left parties and preferred the comparatively progressive FP to the more conservative Tamil Congress and Sivasithamparam. Third, Sivasithamparam’s own cousin Pon. Kumaraswamy contested on the CP ticket. This created a major split among relatives, fellow villagers and family oriented supporters. While some voted for Kumaraswamy many remained non-committal and aloof, voting for neither. A combination of all three factors saw Sivasithamparam with 11662 votes losing to Jeyakkody with 12918 by 1256. This defeat was a blessing in disguise for Tamil nationalism. Like Siva, the FP’s Secretary Appapillai Amirthalingam also lost in Vaddukkoddai. Both defeated leaders – easily the single most popular younger leaders in their respective parties. – began working together in the larger interests of the community. The turbulent seventies saw the Tamil parties forming together the Tamil United Front in 1972 which went on to become the Tamil United Liberation Front in 1976. The TULF contested the 1977 elections on a separatist platform. The Udupiddy electorate had a substantial concentration of so called low caste Tamils. Sivasithamparam moved out of the constituency to Nallur at the polls to enable a minority Tamil candidate to be fielded. Former educationist T. Rasalingam contested and won in Udupiddy. Sivasithamparam though contesting the unfamiliar semi-urban terrain of Nallur, was riding the crest of a TULF wave. He swept the seat with 29858 votes and created history by recording the largest majority of 28, 137 votes in the entire country in that election. The TULF with 18 seats was the largest opposition party in 1977. Appapillai Amirthalingam and Murugesu Sivasithamparam became leader and deputy leader of the opposition respectively. Sivasithamparam became president and Amirthalingam, secretary-general of the TULF in 1978. Thereafter, Amir was referred to as the nation’s leader (Inathin thalaiver) and Siva as the movement’s leader (Iyakkathin thalaiver). Though elected on a separatist mandate, the TULF was prepared to compromise. It tried to cooperate with Jayewardene over the district minister system, the Devolution Commission and the District Development Councils (DDC). It accepted the DDCs against the wishes of the extremists and the militant youth. When the DDC polls campaign was underway, violence broke out in Jaffna with the police running riot. Several TULF leaders including Amir and Siva were arrested and later released. The TULF won all DDCs in the north and Trincomalee and Batticaloa in the east. Had the UNP government allowed the DDCs to work, it may have helped stem the growing tide of violence. But the UNP did not and instead tried to undermine the TULF. Matters declined rapidly thereafter. The 1983 July violence resulted in a tragic upheaval for the Tamil minority. Thousands of families were affected and uprooted. Sivasithamparam’s house in Norris Canal Road and both vehicles in Colombo too were burnt and his family members escaped death miraculously. Siva himself was at Mannar for the TULF convention then. The Sivasithamparam family along with many others relocated to Tamil Nadu. Former Chief Minister M. G. Ramachandran allocated a flat to the family. The TULF president has since remained a resident of Chennai although interspersed with long periods of absence to do politicking in Sri Lanka while leaving his family behind in Chennai. The TULF forfeited their parliamentary seats by refusing to take the mandatory oath of allegiance to a unitary state as provided for by the hastily passed sixth amendment to the Sri Lankan Constitution in August 1983. The TULF however welcomed the good offices of India and cooperated fully in the mediatory efforts undertaken by New Delhi. Sivasithamparam along with TULF colleagues Amirthalingam and Sambandan participated in all forms of Indian sponsored negotiations. These included the Colombo All Party Conference of 1984, the aborted talks in Bhutan in 1985, New Delhi-Chennai-Colombo talks of 1986 and the 1987 discussions in India. In 1987 the TULF accepted the Indo-Lanka accord and re-entered the political mainstream of the island. Sivasithamparam contested the Jaffna and Wanni electoral districts in 1989 and 1994 respectively. Earlier he was reluctant to contest in 1989 along with other ex-militant groups under a common symbol. He was persuaded to do so against his better judgement by Amirthalingam. He failed to gain representation in the polls conducted under the propotional representation system because of its inherent defects and vote rigging by others. Sivasithamparam survived with injuries an assassination attempt by the LTTE in 1989. TULF leaders Amirthalingam and Yogeswaran were killed in the incident. He was shot in the chest and underwent a long stint in hospital. Thereafter the mantle of TULF leadership was Sivasithamparam’s. He shuttled between India and Sri Lanka while facing considerable hardship. The TULF was actively involved in the peacemaking efforts of President Chandrika Kumaratunga from 1994 to 1997 and Sivasithamparam himself played a commendable role in it. Ill health and growing disillusionment with Kumaratunga compelled him in 1998 to return and stay continuously in Chennai till early this year. By this time he was thoroughly skeptical of Kumaratunga and was virtually “retired” from political life. He did not contest the elections of 2000 and 2001. The 2001 poll however saw four parties including the TULF forming the Tamil National Alliance and contesting. It won 14 seats and on the basis of votes received entitled to one nominated seat on a national basis. Sivasithamparam was the unanimous choice for the seat. Any other being nominated, would have shattered fragile TNA unity because of infighting. But there was no vetoing Siva. Besides, the alliance needed a well known leader respected by all shades of opinion. Also there were prospects of peace again with the victory of Wickremesinghe. Despite his failing health the old war-horse returned to Colombo in a wheelchair to become an MP again and play once again a role in the island’s politics, albeit under changed circumstances. The divinity that shapes our ends had other plans. Sivasithamparam leaves behind his wife, son and daughter and their families. The son is in Britain and the daughter in India. His son in law is an Indian national. It is with deep sorrow and a sense of personal loss that one pays tribute to Sivasithamparam. My mother’s village, Thunnaalai, was adjacent to his Karaveddy. In fact, the postal address was Thunnaalai South, Karaveddy. It was part of the Udupiddy electorate that Sivasithamparam represented for many years. Most of my relatives, however, were either Federalists or Communists in the pre-TULF years and therefore opposed him. My father and he were colleagues at the bar as fellow advocates. Although my parents were acquainted with him, my relationship with Sivasithamparam was developed over the past 25 years in my capacity as a journalist. As is usual in any professional interaction between politicians and the press, it had its twists and turns. In my early years as a reporter on the Tamil daily Virakesari, I once wrote a news story that was quite adverse to the Tamil Congress quartet of MPs in the TULF. Their response was not published in the paper due to matters beyond my control. When I ran into some TULF MPs, including Sivasithamparam at Sravasti, he began accusing me unfairly. I defended myself as far as possible but was constrained by the fact that I could not reveal to an outsider what exactly had gone ‘wrong’ in the paper. Realising that I was not at fault, Sivasithamparam acted in a manner that I can never ever forget! He stood up in the presence of his fellow parliamentarians and to my embarrassment folded his palms in the traditional fashion , apologised profusely, and sought my pardon. Such was the greatness of the man. Later on our relationship improved greatly. He once made a glowing reference in parliament to my column in The Sunday Island, “Behind the cadjan curtain.” and said “read DBS Jeyaraj’s graphic account to know the truth”. Unlike many politicians, he was not a gregarious personality and was quite reserved. As time progressed I reached the stage of exchanging remarks in lighter vein with him. He also began trusting me greatly and revealed ‘off the record’ much of what was going on and what he felt about things to me. I last saw him in person in September 1988 when he was staying at the Taprobane (Grand Oriental Hotel) in Colombo. He was very unhappy over the IPKF-LTTE conflict and quite gloomy about the future. He was reading a book of collected writings by former Indian Governor, General and Swatantra Party Leader, C. Rajagopalacharyar, known generally as Rajaji. That image remains poignantly etched in memory because there were many aspects in common between Sivasithamparam and Rajaji once described as his “conscience keeper” by Mahatma Gandhi himself. After I went abroad our contact was minimal and restricted to infrequent telephone calls. When I spoke to him the last time and inquired about his health, he replied dejectedly in Tamil, “Kaadu vaa. Vaa ennuthu” – The cemetery is beckoning me come, come.” Now that call has come. Incidently, Sivasithamparam’s half brother and lawyer, Sittampalam, was the Vavuniya DDC chairman in 1981-1983. When I saw pictures of Sivasithamparam’s return in the newspapers the change in him was very visible. His once impressive physical appearance had deteriorated badly. Age, sickness, and above all worry, had taken its toll. Still, the old lion had the guts and gumption to return. He was persuaded by the TULF old guard to do so as the stamp of his leadership was sorely needed. There was also the question of preventing disintegration because of national list seat intra-rivalry. Besides, Sivasithamparam himself was enamoured of the prospects for peace heralded by Ranil Wickremesinghe’s ascendancy. Tamil leaders like Sivasithamparam remained active in politics and were prepared to play second fiddle to the LTTE not because of power hunger, ambition, cowardice or opportunism but because of a deep sense of commitment. He felt that he and others of the TULF old guard owed it to the Tamil people because it was the TULF that brought separatism into the political discourse. Therefore, he felt that he was duty bound to see the thing through until a satisfactory settlement was reached. This explains certain types of action that may seem blatant compromises to many. The intention however was clear and pure. It also stemmed from a genuine disgust at the continuous pattern of betrayal by the Sinhala establishment. The Tamil moderates were undermined by two factors. One was the perpetual treachery by the Sinhala ruling elite. The second was the rise of Tamil extremism which to some extent was a Frankensteinian monster created by the former Tamil leaders themselves. He was known affectionately as “Our Siva” or “Em Siva” in Tamil on account of his initial M. This also helped differentiate him with T. Sivasithamparam of Vavuniya. Sivasithamparam was a legislator for nearly 17 years and represented the Udupiddy electorate that consisted among other areas of his own place Karaveddy for a decade. This identification led to the description “Udupiddy Singam” (Lion of Udupiddy) in Tamil. Despite his moving to the Nallur constituency as its MP in later years and in spite of his absence in parliament for 17 years, Sivasithamparam continues to be called Udupiddy Singam. His boomingly powerful voice too is leonine and another name for him is “Simmakkuralon Sivasithamparam” (lion-voiced Sivasithamparam). He was born to patrician wealth, being of aristocratic lineage as the scion of a ‘maniagar’ or hereditary chieftain in charge of a revenue division during British colonial days. The family owned a lot of property. He also acquired much prosperity as a successful lawyer. There was a time when Siva was the uncrowned king of the magistrates courts. He had an extensive and lucrative practice with a very large number of Sinhala clients. Yet, he sacrificed almost all his wealth in politics. More importantly, like Amirthalingam, he denied himself material prospects by engaging in full time politics. Sivasithamparam appeared in landmark cases concerning the Tamil armed struggle like the Thuraiappah murder, Neervely robbery, Puloly bank robbery, Kuttimani and Thangathurai cases etc. Later, scheming persons concerned about his growing popularity manipulated matters and sidelined him from cases of that type. Sivasithamparam was incorruptible and a paragon of virtue in every sense of the phrase with not a whiff of scandal about him ever. Focussing on politics at the expense of law and the post-1983 developments had impoverished him considerably. His house at Norris Canal Road and two vehicles were burnt in 1983. After more than a decade, Rehabilitation Minister M.H.M. Ashraff tried to compensate him partially for the losses. A Tamil politician with an axe to grind manipulated some newspapers into publishing negative comments about this. Sivasithamparam promptly declined to accept his rightly deserved compensation. In his later years he underwent tremendous financial strain. Yet he would not accept anything for his personal use. It may be hard to believe that a man who was born wealthy and acquired wealth could be reduced to such deprivation. Many years ago in the eighties, Sivasithamparam once told me about a top Tamil leader who allowed himself the munificent patronage of a prominent Tamil businessman in Colombo. Thereafter, he lost his independence. Siva pointed this out to me in confidence saying “Nakkundaar Naavilanthaar” (Those who lick others for food lose their tongue). He was equally careful about the TULF too. Though the party was hard strapped for cash and lacked resources to do politics like the ex -militant groups, Sivasithamparam refused to resort to shady means to get finances. The TULF relied mostly on contributions by supporters and well wishers rather than on other interests. When the envoy of a country involved in Sri Lanka donated money for a vehicle for the party, Sivasithamparam accepted it reluctantly and after much agonising returned the money. Sivasithamparam was a devout Saivaite and lifelong vegetarian. Worship for him was a long ritual and took up much of his time. In the old days when one rings him at home and is told that he is worshipping there is nothing else to do but replace the receiver, because one knows he is not going to be free in a hurry. Many years ago I wrote an article in The Sunday Times about the current state of the TULF MPs (“Where have all the TULFers gone?”). In that I remarked in lighter vein that Siva, living with his Indian son in law in Chennai, had transplanted the ‘thesawalamai’ to India. The custom in Jaffna is for the groom to live in the bride’s house and vice versa in Tamil Nadu. When I met Siva some weeks later in Colombo he referred to it and said “I know you were making a jocular observation. But it hurt my son in law. To tell you the truth Thambi, we are actually experiencing his generosity”. I was very sad to hear it then. Even as one reflects on the various TULF leaders who have passed away and dwell on the last days of Siva, one is grieved over the tragedy that has overwhelmed the Tamils. The dastardly assassinations of Amirthalingam, Yogeswaran, Neelan Tiruchelvam etc., by the LTTE are horrible events. Mercifully, Sivasitha-mparam survived death then. But political vicissitudes diminished him physically, materially and emotionally. A friend who saw the gentle giant sleeping on a narrow bed in a small room in Colombo told me it was like “seeing a lion chained in a dog’s kennel.” At the time of death, Siva had been reduced to much deprivation. The thing that mattered most to him however was the restoration of Tamil rights and the achievement of political equality on the island. It was that goal which drove him on, despite his ailing state of health. Like many Tamil politicians of his vintage, Sivasithamparam believed in the creed of Gandhian non-violence and participated in many protest demonstrations over the years. Few of his ilk are in Sri Lankan politics today and his loss would be sorely felt. The lion of Udupiddy roars no more. It could be truly said that with his demise, an exemplary manifestation of Tamil politics is no more.